The Apple rally is about to get a whole lot sweeter, says TradingAnalysis.com founder Todd Gordon. Apple shares have rallied more than 10 percent since its market cap crossed $1 trillion for the first time ever in August, and according to Gordon, the stock could get a bigger boost following its earnings report in late October. "Apple is in a very solid technical position," Gordon said Tuesday on CNBC's "Trading Nation." 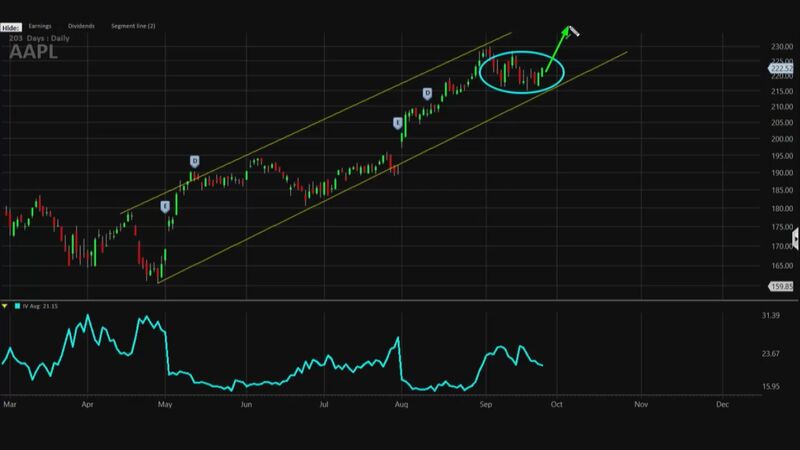 He noted that on a chart of Apple, the stock has been trading in an upward parallel channel, now moving toward the higher end of that trend. And while he points out the stock has been in consolidation for a bit, Gordon also believes that Apple is "awaiting an end to that consolidation" that will result in a "resumption to the uptrend." In other words, Gordon believes that Apple will break out of its current pattern and head toward the upper end of the channel, rallying to as high as $235 a share. To play this predicted rally in Apple, Gordon plans to buy the Nov. 2 weekly 230-strike call and sell the Nov. 2 weekly 235-strike call for a total of $1.56, or $156 per options spread. This means that if Apple were to close below $230 on Nov. 2, then Gordon would lose the $156 he paid for the trade. But if Apple were to rally and close above $235, as Gordon predicts it will, then the trader would make a maximum reward of $344. Apple has rallied 31 percent this year. It closed on Tuesday at $222.19 a share.